Modern contemporary styling is perfectly executed in the design of the Valpico Collection. A cool grey with olive undertone finish is utilized to achieve a sleek appearance only to be enhanced by the clean lines of the case goods and bed. 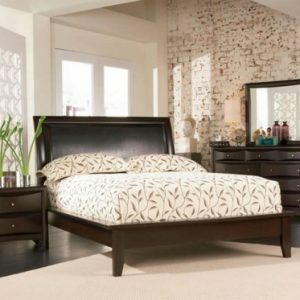 Slightly angled square polished chrome hardware and louvered paneling on the bed further accent the collection.